It doesn't matter how good a garden design is, if it isn't well executed and planted it will never achieve the potential of the design. We've been involved with horticulture since 1851 and with making gardens since the mid 50s, and are justifiably proud of our record for delivering great results, no matter how challenging the project. Your garden is one of your home’s most valuable assets and deserves to be treated as such. Our team of experienced BALI registered landscaping professionals offers many services, ranging from complete construction projects to specialised individual elements, all backed up with a guarantee of quality and expertise. Our extensive range of specialisms includes outdoor kitchens, water features, patios, outdoor lighting, irrigation and construction of garden buildings such as gazebos. Based in both London and Surrey our team has experience of a wide range of gardens and outdoor spaces, including courtyards, rooftop terraces, town house gardens, front gardens, eco builds, basements, container gardens, outdoor kitchens and country estates. We fully understand the complexities and opportunities of working in outdoor spaces with difficult access and limited space, as well as having experience of larger gardens and spaces requiring incremental construction phases. We dedicate ourselves to making the whole process of designing and creating your garden as stress-free and as rewarding as possible. We pride ourselves on our ability to work in your garden with the minimum of intrusion and disruption to your life and environment. We commit to finishing your garden to your satisfaction and delivering you the garden of your dreams for you to enjoy. Early in 2015, our design and landscaping team accepted the ultimate challenge - to design and build a show garden on site at the Surrey branch of Clifton Nurseries in Weybridge. Designed to bring the indoors outdoors, this bold contemporary garden combines modern clean lines with a pinch of shabby-chic - all of which is softened and brought to life by some creative planting. This show garden is a bold statement, not only of the quality of our expert landscaping skills, but also of our ability to be at the forefront of contemporary trends in domestic garden design. Proving very popular with visitors, this striking garden includes an outdoor 'living room' featuring a working fireplace and George Smith Outdoor upholstered Chesterfield sofas, as well as a designer Fire Magic outdoor kitchen flanked by a herb garden. 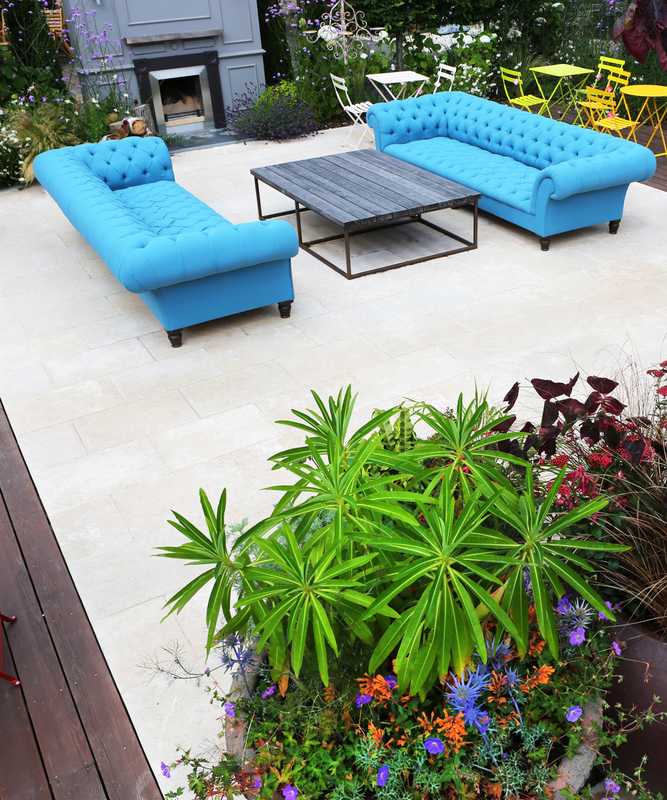 Tumbled limestone paving and larch decking is softened by a randomly-textured planting scheme with year-round colour. A bespoke rust water feature surrounded by wildflower meadow adds movement to the garden as well as acting as a focal point for the bees and butterflies. Carpinus betulus full standards with cube heads surround the perimeter providing height, structure and a green backdrop to the garden. Stylish outdoor lighting extends the use of the garden into the evening for any special evening events.